Q: How do I reserve baby stuff? A: After deciding what gear you need, you can go directly to our “rentals” page where you can let us know the quantity of each item you need along with your contact info and vacation details. We will get back to you within 2 working days to finalize and confirm your reservation. Q: What are your delivery and pick up policies? A: We offer island wide delivery. FREE delivery for Kapaa area. For all other areas we have two delivery options. You can select from our “Standard delivery” and all items will be left outside in a safe area, please note that this option does not include setup or you can select our “Premium delivery” and we will arrange to have your items set up and ready awaiting your arrival. Deliveries are made between 12noon and 5pm. A $50 after hour delivery charge is assessed after 5pm. All pick-ups should be ready by 10:00am on day of departure, unless previous arrangements have been made. If you decide to extend your rental, you must notify Kauai Baby Gear at least 24 hours prior to return date. Q: Do you carry car seats? A: NO. Due to the liability we do not carry car seats. However most airlines do not charge for you to check in your infant or toddler car seat. We highly recommend due to our highly dangerous roads that you bring your own car seat that you are familiar with. Q: Can you deliver to the airport? A: NO. We cannot deliver equipment directly to the airport due to FAA security. Q: How is delivery and pick up scheduled? A: Delivery depends on what type of accommodations you are staying at. If you staying at a large chain hotel, most times we will be able to leave your items at the front desk, and you can do the same for check out. If you are staying at a smaller hotel, time-share (condo), or vacation rental home then we require you make arrangements with your property manager for us to gain access to your place prior to your arrival. Q: Is there a minimum number of days required for rental? Q: Is there a minimum amount for orders? A: Yes our minimum is $50.00. A: We service the entire island of Kauai. Whether you are staying at a private residence, hotel, B&B or condo we are here to meet your needs. A: All cancellations made prior to 48 hours will be charged a one-time fee of $25. Cancellations placed within 48 hours of scheduled delivery will be charged for one full day of the full reservation amount. There are no refunds for early termination of rentals. Q: Are your products safe and clean? A: Safety is our number one concern at Kauai Baby Gear. We register every product with the manufacturer and are kept notified of all equipment recalls. We sanitize our products before and after every use and use non toxic organic cleaning products. Sheets and all cloth materials are laundered with fragrance free detergents. 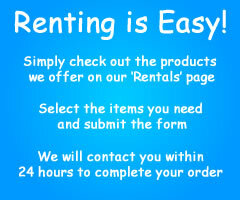 Baby Rental Gear is replaced on a regular basis to bring you the top of the line, latest gear in good condition. Q: What if I lose, damage or return my gear dirty? A: Equipment must be returned in clean condition as it was received. Failure to do so will result in a $50.00 additional cleaning charge. Lost or damaged equipment will be charged the retail amount to your credit card. Q: Do you assemble cribs? A: All of our cribs are fully assembled cribs that fold. There is no assembly required. A: We use Paypal for all of our payments. Basically once you let us know what items you need we generate a Paypal invoice and send it to you via email. Once payment in full is received we will schedule delivery of your items. Paypal does accept all major credit cards. A: To ensure availability, it is suggested you place your order as soon as your travel plans are confirmed. Of course we understand that sometimes plans can not be made until the last minute so we do our best to accommodate your needs. A: If you are not satisfied, we will be happy to replace the item as soon as possible so you can enjoy your trip.